Celebrity endorsements for products is not a new thing. Almost every industry spends a lot of their marketing budget making known personalities vouch for their products. Smartphones are not untouched by this behavior. While many celebrities are brand ambassadors for various smartphone manufacturers (for instance, Amitabh Bachchan for OnePlus, Deepika Padukone for Oppo), few just grace the audience with their presence during launch events (for instance, Randeep Hooda and Nimrat Kaur at Huawei Honor launch). Then there are the ones who have announced their brands - 'Being Smart' phones by Salman Khan. Recent to join this wagon is the cricketing legend Sachin Tendulkar with his srt.phone, which will be produced by Smartron, a brand in which he is an investor. Smartron srt.phone will be launching coming Wednesday, i.e., May 3rd. The brand took to the microblogging website Twitter to announce the same. In case you still couldn't make it out, the name of the device is the initials of Sachin's name (Sachin Ramesh Tendulkar) followed by the keyword 'phone'. The naming strategy follows the one adopted by Smartron for the t.phone and the t.book, both of which were launched last year. 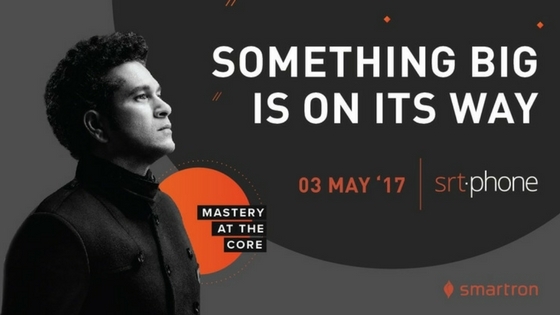 While no specifications or features have been teased so far, the upcoming device will be inspired by the God (read Sachin) himself. We expect the smartphone to feature Sachin's autograph at the rear. Smartron srt.phone is supposed to be Flipkart exclusive. As die-hard Sachin fans, we are waiting for the day. Are you?